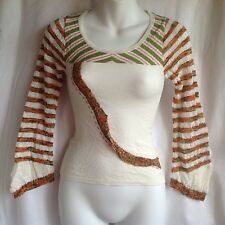 Save The Queen Top Pre-loved Mesh With Lining Nice Details Size XL ( US medium ). Condition is Pre-owned. Shipped with USPS Priority Mail. Bust 14" stretch to 19". made in Italy. Save The Queen long sleeve blouse with bell sleeves. Floral pattern on sleeves. Length approx 23". Armpit to armpit approx 16". Stretch Top Blouse. bust 15.5" stretch to 21". made in ITALY. sleeve 27". Embroidered Multicolored Top. SAVE THE QUEEN. Lenght from neck : 22" - 56 cm. Armpit to armpit:min 17 - 43 cm. Save the Queen. bust 17"will stretch to 22" . made in Italy. length 25". Save The Queen! made in ITALY. length front 28" back 24". sleeve 26". Cross Chest: 18”. Waist: 16”. Total Length: 26”. Shoulders : 16”. We will work things out. L ov e th e uniquenessof thiss we at er ! Bo ld & vibrant colors! Length 23”. Save The Queen Off Center Vneck Embellished Fish Print Top Size M Length measures approx 24" Chest measures approx 30" unstretched Excellent Used Condition Comes from Smoke-free home Please email any questions, I will promptly respond I will combine shipping, please ask for a quote Payment is expected within 72 hours of auction end I will ship promptly after receipt of payment, usually within 24 hours ALL MEASUREMENTS ARE APPROXIMATE. This fun unique shirt is in GREAT preloved condition. In opinion I think it is more of a s/m. It is made of 88% nylon 12% spandex, hand wash care, deep v neck, slight dip on back neck, semi sheer teal under multi brown crochet. Made in Italy. waist 17" - - - - - 22". length 27". Very good used condition. Sold as is. SAVE THE QUEEN top. made in Italy. totally stunning top. condition: excellent. Unusual top with 3/4 silk sleeves. The body is a stretchy, nylon/elastane blend. Beautiful ribbonwork at the cuffs, with little ties with ceramic flowers. The back has embroidered details. Superb quality knit top from Save The Queen! Black and white striped knit cotton blend than can be worn off-shoulder if desired. Back, contrast panel is navy blue with white embroidery. length: 18". Arm: 17" underarm to cuff. Length: 22". Chest: 17" Flat. Color: Grays/Pinks. Adorable top by Legatte Save the Queen -check it out! Adorable top by Legatte Save the Queen made in Italy - pre-owned, great with no flaws. (This is one of the limitations or risks of buying online. Nothing we send is so badly described that it would qualify as "item not as described". 2) FIT: we provide. We only provide guidelines. Check a similar item you own to this item to see if it might work.